The Centers for Medicare & Medicaid Services (CMS) Division of Tribal Affairs offers a wide variety of free materials on its newly redesigned AI/AN Outreach and Education Resources web page. Find materials on how to sign up for health coverage, health benefits for specific medical conditions, and how to access care in a variety of settings. 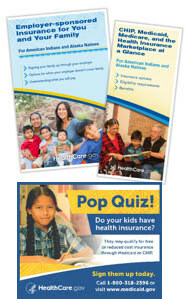 Resources include print advertisements; radio and video public service announcements in English and five Native languages; brochures and fact sheets; and training for enrollment assisters and health care providers. Use these materials in waiting rooms, at outreach events, and during one-on-one application assistance sessions. Download them from the website or order them from the CMS warehouse.